But it's the base of the building that really makes the tower so unique. The bottom nine of its 59 stories are stilts. This thing does not look sturdy. But it has to be sturdy. Otherwise they wouldn't have built it this way. The condition that St. Peter's gave to Citicorp was that they build the church a new building in the same location. 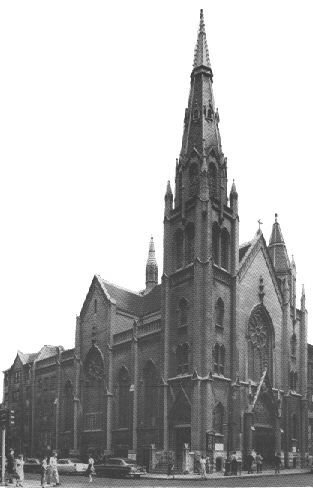 Provided that corner of the lot not be touched, he company was free to build their skyscraper around the church and in the airspace above it. Nine-story stilts suspend the building over St. Peter's church. But rather than putting the stilts in the corners, they had to be at the midpoint of each side to avoid the church. Having stilts in the middle of each side made the building less stable, so LeMessurier designed a chevron bracing structure—rows of eight-story V's that served as the building's skeleton. According to LeMessurier, in 1978 he got a phone call from an undergraduate architecture student making a bold claim about LeMessurier's building. He told LeMessurier that Citicorp Center could blow over in the wind. The student (who has since been lost to history) was studying Citicorp Center as part of his thesis and had found that the building was particularly vulnerable to quartering winds (winds that strike the building at its corners). Normally, buildings are strongest at their corners, and it's the perpendicular winds (winds that strike the building at its face) that cause the greatest strain. But this was not a normal building. But that's only if the tuned mass damper, which keeps the building stable, is running. LeMessurier realized that a major storm could cause a blackout and render the tuned mass damper inoperable. Without the tuned mass damper, LeMessurier calculated that a storm powerful enough to take out the building hits New York every sixteen years. Hurricane Ella never made landfall. And so the public—including the building's occupants—were never notified. And it just so happened that New York City newspapers were on strike at the time. The BBC aired a special on the Citicorp Center crisis, and one of its viewers was Diane Hartley. It turns out that she was the student in LeMessurier's story. She never spoke with LeMessurier; rather, she spoke with one of his junior staffers. Hartley didn't know that her inquiry about how the building deals with quartering winds lead to any action on LeMessurier's part. It was only after seeing the documentary that she began to learn about the impact that her undergraduate thesis had on the fate of Manhattan. Reporter Joel Werner and producer Sam Greenspan spoke with Diane Hartley, and Hartley's thesis advisor David Billington. We also spoke with Michael Vardaro, who wrote the AIA Trust's white paper about the case, and to LeMessurier's former staffer Joel Weinstein.